Trusted for Equipment, Parts, & Service since 1942! Whether you’re looking for a subcompact, utility, or a farm tractor – you can find what you’re looking for in our inventory. We have new and used models of brand names such as Massey Ferguson, AGCO, Kuhn, and more. These are made for smaller properties and usually have anywhere from 15 to 25 horsepower. Tractor manufacturers will frequently offer a variety of hydraulic and transmission options, as well as smooth three-point hitch operation and easy PTO control. Along with a boost in size, compact tractors usually range from 25-60 horsepower. These machines are able to take on larger tasks due the increased horsepower and heavier loader lift capacity. Larger and more powerful in order to complete bigger tasks, these tractors have 45-85 hp and weigh up to 3,000 lbs. You can use these powerful machines for post hole digging and to push deep snow in the winter. Somewhat self-explanatory, these are large and powerful tractors built for commercial farming, so they include many features. They often have many hydraulic ports and PTO’s. A farming tractor will usually boast greater than 85 hp. Once you decide on the size and specifications of your tractor, another big decision is whether to get a new or used model. Newer tractors typically have more features for better capabilities and the slight increase in price is ok because tractors hold their value. If you do decide that a used model tractor will be more effective for your needs, our inventory of used tractors are all from reputable brands and have passed a thorough inspection. Once you’ve decided exactly what you want, you can select your ideal tractor from our collection. Please, don’t hesitate to contact us with any questions. 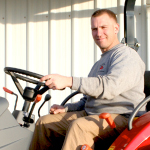 Doug started at Lauf Equipment while attending high school in 2009. 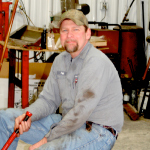 After receiving his AAS (Associates of Applied Science) Degree in Farm and Industrial Equipment from Oklahoma State University IT in 2011, Doug started working as a full time technician. Doug enjoys hunting, fishing, and anything outdoors. Shannon works full time as a service technician. In his spare time, Shannon enjoys hunting, fishing and spending time with his family. He is married to Debbie. They have four children and three grandchildren. 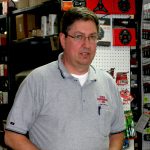 Scott works at Lauf Equipment on Mondays helping pick up and deliver equipment. He helps with oil changes and maintenance on all equipment. Scott is a full time lineman for Century Link. He owns a farm in Lohman. Farm owners, hired workers, and their families face numerous hazards that can result in injuries and illnesses including sprains and strains from overexertion, being struck by or caught in machinery, lacerations from hand tools such as knives, falls from ladders, pesticide poisoning, and heat or cold stress.